I was so glad that this lovely blog has succesfully being renewed for the year of 2019 on 12 January 2019. Your G Suite domain name, mialiana.com, was successfully renewed with enom for one year. 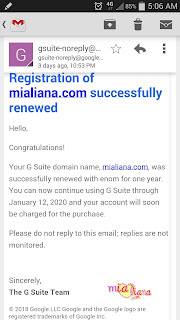 You can now continue using G Suite through January 12, 2020 and your account will soon be charged for the purchase. Much easier for the automatic renewal set up and my credit card will deducted USD10 for it. Really love this blog so much as part of my life.